After a night spent camped in the garden of the very nice B&B run by Rudi and Ella (yep, more Dutch), chatting with Richard – an East German-born biker, whose childhood holidays had been spent in then-Communist Yugoslavia and Romania – we headed for yet another different facet of Transylvania. 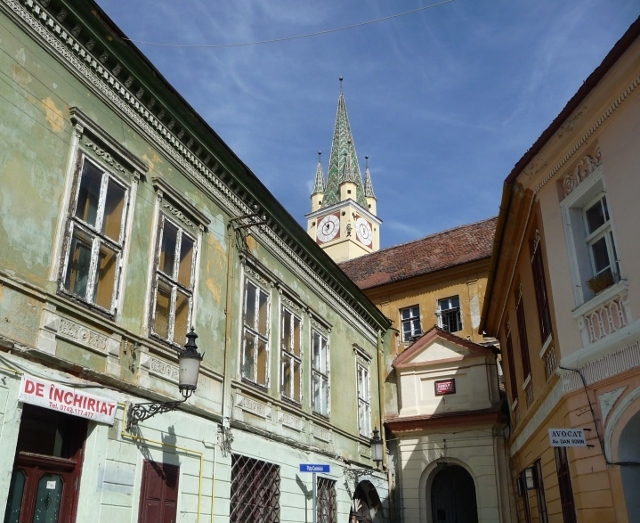 We’d already seen the fortified churches of Hărman and Prejmer, a small taster of those which dominate the area west of Brașov. After a long, slow trek through seemingly endless roadworks, we arrived at Biertan. 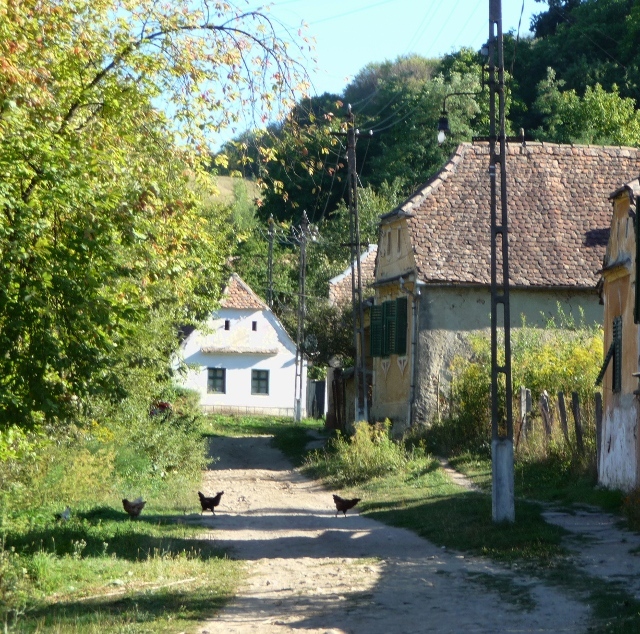 We’d barely got into the village when the fortifications were visible soaring above the distinctive houses lining the road. The church sits on a small rise, surrounded by a pair of strong walls and no less than seven defensive towers. 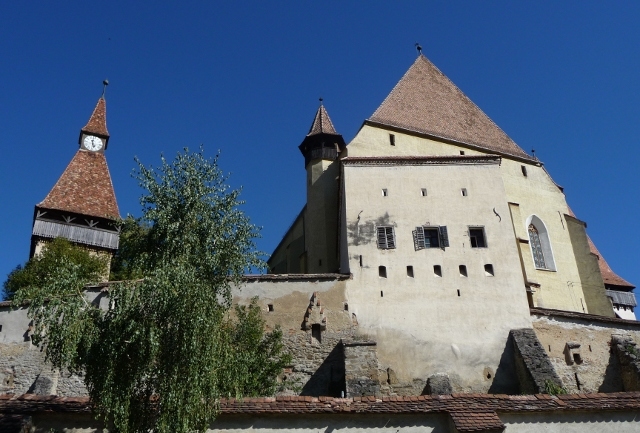 From the village’s main square, you walk up a steep, covered wooden walkway through the walls and into the courtyard. When you enter the church itself, the sight is still impressive – the arched ceiling is high, high above, whilst the sides of the upper galleries are painted to signify which guilds funded t hem. Just next to the large gilded alter at the far end, a door leads through to the sacristy. 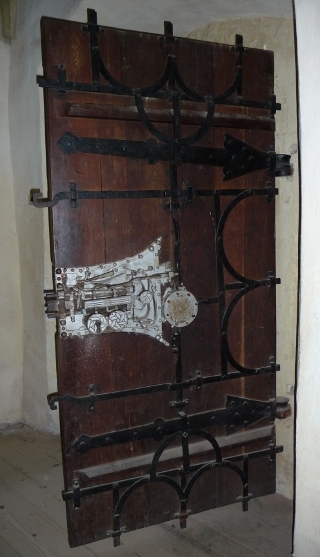 That door is also fortified – with a complicated locking mechanism with bolts at no fewer than 19 points around the frame! A couple of the towers are in use as small display areas – one as a lapidarium for some very grand tombstones, whilst another showed a reconstruction of a typical period Saxon household. That particular tower had had a very different domestic role, back in the day – if you had a serious marital dispute, and wanted a divorce, you and your spouse were locked up in there together for several days. Presumably, the intention was to make sure that only utterly irreparable marriages ended, but it seemed to us to be more likely to reduce the divorce rate – at the expense of an increase in the murder rate! The next village, Richis, might not have had anything to rival the grandeur of Biertan’s church, but the beautiful old (Dutch-owned) Parish House in the middle of the village allowed camping within the courtyard. 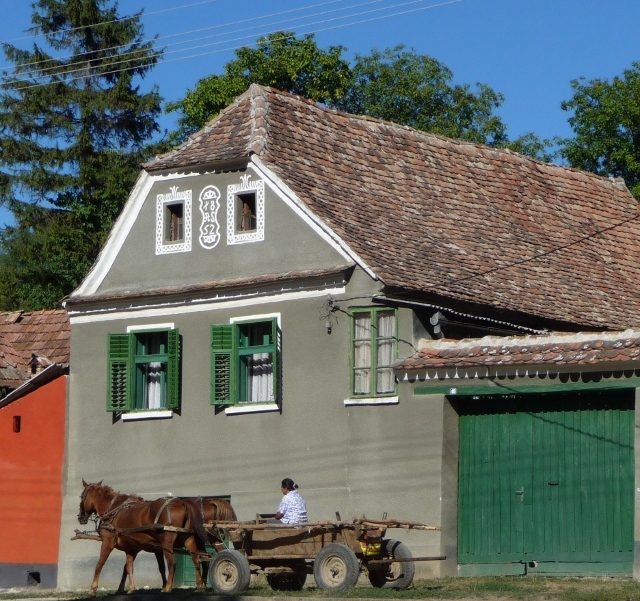 With the van settled in place, we wandered through the village as the evening light brought the colours of the house frontages alive, echoing with the clip-clop of the passing horse-drawn carts. We didn’t really plan to stop in at the larger town of Medias, but since we were heading by anyway, we thought we might as well. 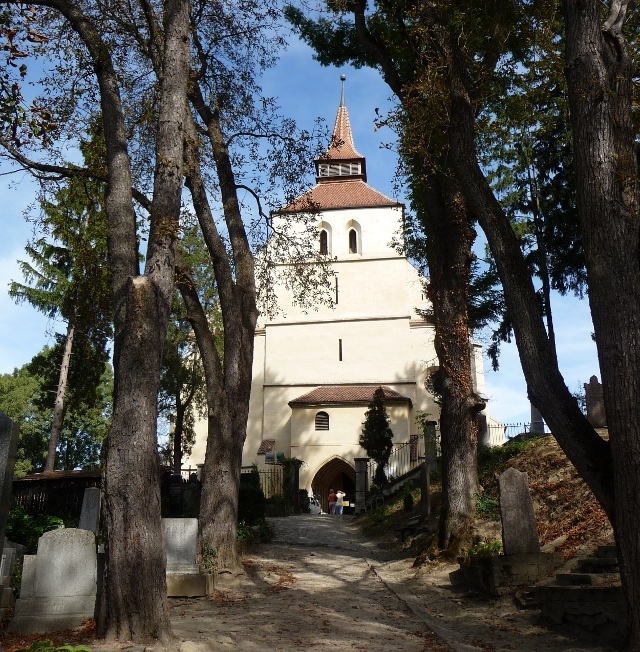 Finding the church was easy – the spire was clearly visible – but finding the entrance wasn’t, since the fortifying walls had been built right up to and against over the centuries, placing the churchyard right in the centre of a solid block of shops. Eventually, we dived up a small and almost anonymous passageway – and we were there. The only sign of life was a couple of other tourists lounging on a bench, waiting for the arrival of somebody with a key. When we entered, it was quickly obvious that we weren’t alone, with organ music echoing grandly around the interior. The backrest on the wooden pews flip-flopped to and fro, allowing people to face forward or backward – just like those in an old tram. The paintings on the altar are anonymous, but believed to be the work of a Viennese craftsman, since one of the saints seems to have a backdrop of Vienna’s cityscape! 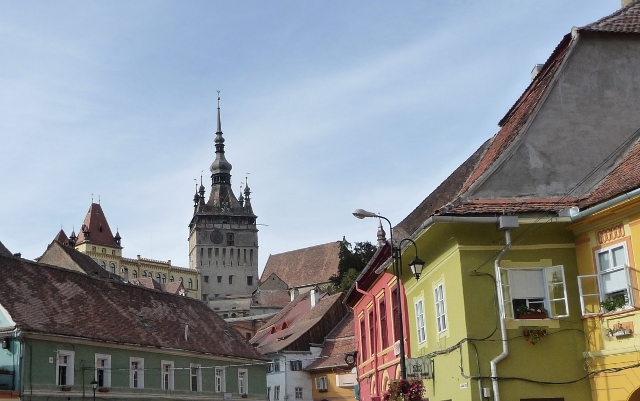 Finally, we arrived in the city of Sighișoara. The town’s campsite is a very short walk from the centre, in the grounds of the local swimming pool. The (outdoor) pool seemed to be somewhat dry when we arrived, and the first words of the manager were “I’m sorry…”. Not a great start, they’re closed. Then she went on “…but our motorhome area is full tonight.” Right, so they’re open, but we still can’t stay. Bugger. No, wait a sec… We _could_ stay, but instead of being in a gravelled cat-litter tray with prison-like walls, we have to bring the van in and park it on that nice (and utterly empty) grassed area hemmed in by willow trees. What a pity. How will we cope? After a slight delay, caused by the gardener insisting on trimming a tree back so we had a slightly nicer spot, we wandered into town to get some lunch and have a good look around. The old town sits on a small and steep hill, high above the new town. You climb steeply, and enter through the walls, again protected by bastion towers built by the various town’s guilds. The town is almost perfectly complete – very few modern interloper buildings. The clock tower you enter through has a series of small wooden figurines emerging periodically – one side indicating the day of the week, the other day or night. The two main squares of the town join each other, and are both dominated (of course) by the tourist industry. To one side, somebody sits, carving highly-decorated traditional wooden spoons. Old ladies sit behind tables laden with embroidery for sale. Cafes and restaurants line the squares. One of them really does lead the others in tack and pricetag, though – and no great surprise, since the building is reputed to have been the birthplace of our old friend Vlad Țepeș. From almost any vantage point in the old town, the ground drops sharply away – except to one side, where it rises just as sharply. 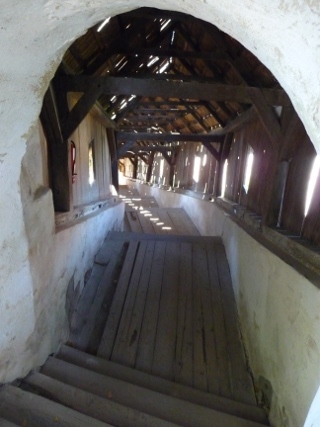 Another wooden covered staircase leads you up towards the Church on the Hill. No imagination went to waste in naming that. Inside, the sides of the plain interior are lined with ornate painted wooden chests, restored by students of a German folk high-school. After more wandering, rounded off with a drink on the ivy- and vine-clad terrace of a little backstreet cafe, we start to head back down the hill to the campsite. Before we do, though, we pause for some more photos of the fortifications. I reach to take the camera (in a padded Samsonite case) from Ellie’s hand, but the strap gets caught on a ring, and my grip on it isn’t enough. It drops, and hits the ground. We’ve been having problems for a few months with the screen on it, going completely white and only behaving with a solid squeeze of the body, probably due to a connector inside not doing its job properly any more. Since the camera has no viewfinder, the only way to take a picture is by looking at that screen. Unfortunately, that shock is too much for the last gasps of that connector, and we’re left with a realistically unusable camera. It’s done great service – in the four years we’ve had it, it’s taken close to 35,000 photos – two-thirds of them on this trip. Fortunately, when we started having the problems, back in Bosnia, Nathan and Anna lent us their spare camera – not in the first flush of youth, but working just fine. So we’re not totally stuffed. When we get back to the campsite, we find that the manager wasn’t joking when she said the main van area was fully booked – that cat-litter tray is now rammed with yet another organised fridge-freezer tour. And when I say full, I mean _FULL_. They could not, quite literally, fit one more vehicle in. There was a couple of smaller van conversions in there, and it’s just as well – because if they’d been full-size too, there’d have been difficulties in shutting the gate. Smiling at our good fortune in not being squeezed in there too, we saunter through to find that we’ve got company on our grassy area. There’s a largish tent been pitched, next to a quadbike towing a large box trailer. Given the size of the lawn, the tent seems to be strangely close to our van, though. We get closer, and just stop dead in mid-stride as we realise just HOW close it is. It’s so close that we have to step over their pegs – not just guyropes, but the actual edges of the tent – to get to our sliding door. Not only that, but it’s pitched so that their tent door is right next to ours. Inches away. They and us are the only occupants of an area maybe 80 metres long and 10 metres wide. What? Why? Let’s just say that our speechlessness doesn’t last long… We decide the easiest option is just to move the van. Unfortunately, and I still remain baffled as to how, we actually managed to do so without running over their tent. I just wish we’d had the presence of mind to take a photo before moving the van. This entry was posted in Art & Culture stuff, By Country - Romania, Personal stuff, Travel stuff. Bookmark the permalink.